India's exports revival continued for the eighth successive month, recording 19.77 percent growth during April 2017, official data showed on Monday. 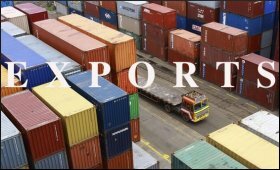 According to data released by the Ministry of Commerce and Industry, exports grew by 19.77 percent to USD 24.63 billion from USD 20.56 billion worth of merchandise shipped out during April 2016. "In continuation with the double-digit growth exhibited by exports during March 2017, exports during April 2017 have shown growth of 19.77 percent in dollar terms valued at USD 24,635.09 million as compared to USD 20,568.85 million during April 2016," the ministry said in a statement. "Non-petroleum and non- gems and jewellery exports in April 2017 were valued at USD 17,718.87 million against USD 15,136.41 million in April 2016 -- an increase of 17.06 percent." However, the country's imports during the month under review increased by 49.07 percent to USD 37.88 billion. India's oil imports during last month increased by 30.12 percent to USD 7.35 billion. "The global Brent prices (USD /bbl) have increased by 25.40 percent in April 2017 vis-à-vis April 2016 as per World Bank commodity price data," the statement said. The data revealed that non-oil imports were up by 54.50 percent, to USD 30.52 billion from USD 19.75 billion in the corresponding month of last year. Consequently, the trade deficit during the month under review was higher by 173.47 percent to USD 13.24 billion from USD 4.84 billion reported for April 2016. Further, the ministry disclosed the services exports data provided by the Reserve Bank of India (RBI). "Exports during March 2017 were valued at USD 14,179 million registering a positive growth of 8.57 percent in dollar terms as compared to negative growth of 3.76 percent during February 2017," the ministry's statement said. "Imports during March 2017 were valued at USD 8,267 million registering a positive growth of 14.26 percent in dollar terms as compared to negative growth of 13.96 percent during February 2017." The ministry said that cumulative trade balance including merchandise and services sectors has improved. "Taking merchandise and services together, overall trade deficit for April-March 2016-17 is estimated at USD 40,980 million which is 16.87 percent lower in dollar terms than the level of USD 49,297.53 million during April-March 2015-16," the statement added.